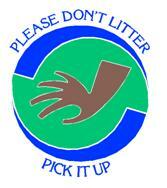 (DEQ) – Due to the celebration of the Annual Environmental Awareness Month (EAM) in April. The Division of Environmental Quality (DEQ) cleanup brigade will be deviating from its regular 1st Saturday of each month cleanup and instead encourages volunteers to join the Island Wide Cleanup which is scheduled for April 23, 2010. The time will be announced later. Volunteers will split into groups and go to selected beach or roadside and go North, South, East or West cleaning for about 2 hours or when finished. This is a cleanup that should not be missed, so join DEQ’s EAM-Island Wide Cleanup and “Pick It Up!” Let us work together for the health of our coral reefs and cleanliness of our beaches for everyone to enjoy.